I finished the Expert level in early May, and so then turned my sights on the new 'Extremist' level that Dorte added. And as Dorte has said, "If you are really an extreme reader, you will do your best to read novels from 21 different countries or states". However a few other things have taken priority since then - along with some new projects and a significantly increased workload at work, I have also had a lot of freelance writing to do (eg author interviews for the Weekend Herald), and have been working on the (now postponed) inaugural Ngaio Marsh Award for Best Crime Novel. So unfortunately my 'global reading' has been on hiatus somewhat, although I still have been reading a lot - just predominantly NZ, US and UK crime fiction - often in preparation for author interviews or other reviews etc. Right now, in terms of completing the extremist level, I officially have two more books to go - one African crime novel and one South American crime novel. However, I may tweak or bolster my final 21 book line-up with a replacement Asian or North American crime novel, to add even more variety than I currently have in those continents (e.g. try and read a Mexican or Cuban crime novel, rather than having two US and one Canadian etc). So, getting back on the 2010 Global Reading Challenge horse, I've now just started reading BLOOD SAFARI by Deon Meyer, as my third African crime novel (following crime novels set in Ancient Egypt and contemporary Botswana). I've heard lots of great things about Meyer's crime writing, so I'm looking forward to reading this South African tale. In BLOOD SAFARI, Lemmer is a freelance bodyguard for Body Armor, a personal security company in South Africa. Lean, angry, violent, he is way down on the price list where the bargains are to be found. As le Roux and Lemmer look for clues in the Lowveld, it becomes clear someone wants to keep them in the dark. Someone who will go to any lengths to stop them asking questions. When they are attacked and almost killed, Lemmer decides to go after whoever is hunting them - against all odds. I am really looking forward to reading this, and its great to get back into some more 'global reading'. Dorte has done such a fantastic job with the challenge. Have you read any of Deon Meyer's novels? What do you think of South African-set crime fiction? 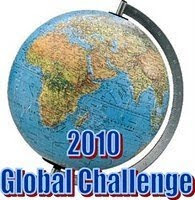 Are you participating in the 2010 Global Reading Challenge? Do you like trying books from a diverse range of countries and authors? Comments welcome.